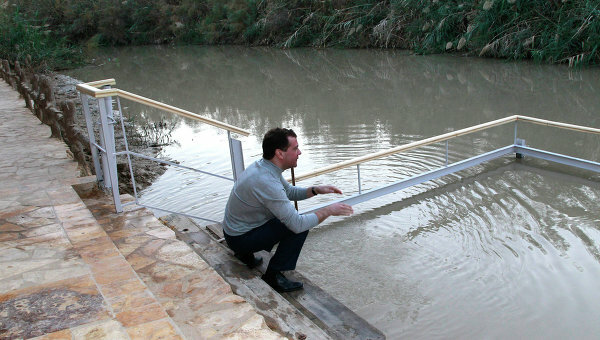 Russian President Dmitry Medvedev took an Epiphany dip in the holy waters of the Jordan River on Wednesday. Epiphany, also know as Theophany, is one of the Great Christian Feasts. The Russian Orthodox Church celebrates it on January 19 in line with the Julian calendar. The Russian leader visited a Russian Orthodox center for pilgrims, currently being built near the area where Jesus Christ is believed to have been baptized by John the Baptist. "Visiting the Jordan River on Epiphany Day is a great joy for any Orthodox believer. I'm convinced that the hotel will soon take in its first pilgrims. Happy holiday," Medvedev wrote in the guest book.